Adult Camp: June 9–13, 2019, Camp McDowell, Double Springs, Alabama. Youth Camp: July 1–5, 2019, Camp Lee, Anniston, Alabama. Camp Fasola is a summer camp that provides an immersive experience for learning of Sacred Harp shaped note singing, history, and traditions. Multiple daily sessions are devoted to teaching Sacred Harp singing as well as times for singing, fellowship, and recreation. This experience provides a casual environment for learning and singing this unique American a cappella music form, which has its roots in early America. 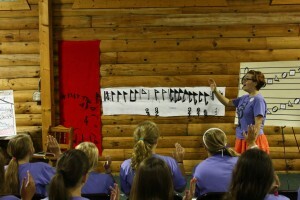 Young campers learn the rudiments of Sacred Harp singing at Youth Camp. 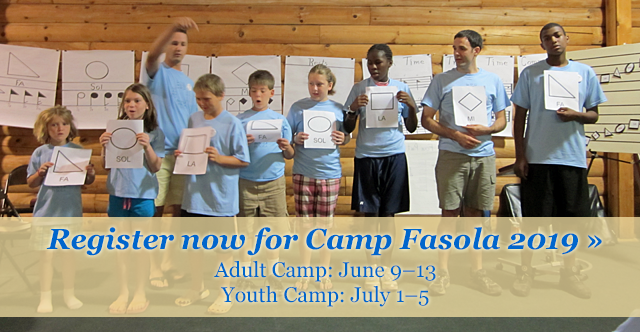 Camp Fasola is open to youth and adults with instruction provided for both beginning and experienced singers. Multiple tracks of classes suited to different experience levels are taught each of the three full days of camp. Traditional summer camp activities focused on building and extending friendships of singers are provided. The final camp night features a community singing event in which non-campers from the broader Sacred Harp community gather to sing with the campers. The five day/four night camp has been held annually since 2003 with more than 3,000 campers participating. Two sessions per summer have been held since 2008. Camp Fasola Europe has been held in Poland in even numbered years since 2012. Camp Fasola has received national recognition as a highly effective traditional singing school project for the purpose of preserving and extending Sacred Harp singing for the next generation of singers. It is also great fun! The Sacred Harp Musical Heritage Association (SHMHA), a non-profit 501(c)(3) organization whose purpose is the preservation and perpetuation of Sacred Harp singing, sponsors and conducts Camp Fasola.